Tickets to the Brooklyn Museum are included with the Love For the Arts Package from Comfort Inn Brooklyn - Downtown. This Brooklyn Hotel is ideally located near top Attractions, including the Brooklyn Museum. Visitors who choose the Love for the Arts Package will have special access to this popular Museum. The Love for the Arts Package makes it easy to plan an art-infused visit to Brooklyn. This package at Comfort Inn Brooklyn includes 2 adult tickets to the Brooklyn Museum. Visitors who choose this package can also avoid the lines the Museum with expedited entry. Some visitors are surprised to learn that the 2nd largest Museum in New York isn’t in NYC. 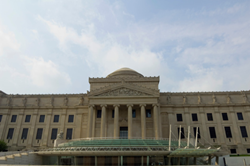 The Brooklyn Museum, at 560,000 square feet, holds that distinction. The Museum’s collections include more than 1.5 million objects, and their holdings span thousands of years. From the impressive Egyptian collection to works by Norman Rockwell, there is something to interest every art enthusiast. Visitors who choose Comfort Inn Brooklyn will have easy access to all of the attractions that New York City has to offer, but many find that there are plenty of Brooklyn attractions to enjoy during a stay. This Brooklyn Hotel is located a short walk from Barclays Center, making it a popular choice with visitors coming to attend an event at that venue. The Hotel is also near top dining and shopping destinations in the city. Both business and leisure travelers appreciate the reasonably-priced Accommodations that are located near some of the best that Brooklyn has to offer. Those planning to book the Love for the Arts Package should make reservations in advance as availability is limited. Reservations for this and other special offers at Comfort Inn Brooklyn can be made online or by calling 718.855.9600. Comfort Inn Brooklyn – Downtown is a conveniently-located Brooklyn Hotel. Positioned in the heart of the Brooklyn Restaurant District, this Brooklyn Hotel is also within walking distance of Barclays Center and near other top Brooklyn Attractions including the Brooklyn Bridge, Brooklyn Navy Yard, and Brooklyn’s Prospect Park. Guests who choose Comfort Inn Brooklyn – Downtown will also be just a short train ride from all the best Manhattan Dining, Shopping, and Attractions such as Times Square, the Empire State Building, Rockefeller Center, and much more. The Guest Rooms at this Downtown Brooklyn Hotel feature thoughtful amenities including free high-speed wireless internet, LCD TVs, guest laundry services, and free newspaper delivery. Guests will also enjoy a free hot breakfast during each morning of their stay. Visiting Brooklyn? Choose Comfort Inn Brooklyn – Downtown – A Brooklyn Hotel. Visit the Hotel's Website or call 718.855.9600. Browse our Brooklyn’s Visitors Guide for information about Activities, Attractions, Shopping, and Dining options located near our Brooklyn Hotel. Comfort Inn Brooklyn - Downtown is an ideally-located Brooklyn Hotel that is perfect for visitors who want to explore both Brooklyn and New York City.